Mould is a serious nuisance that affects almost every home at one time or another. Spores in the air can affect your health so it is important to deal with mould properly as soon as you can. But this is sometimes easier said than done. Black mould, or mildew, is the most common type of mould found in homes, and the easiest to deal with. It can be alarming to discover black mould in your home, lurking around bathroom tiles, on walls or ceilings or behind furniture. But it is not unusual and, thankfully, not very difficult to remove. Read on to discover how to get rid of mould in your home once and for all. Hire a Contractor or DIY? A small amount of black mould in the home is a common problem and one that is relatively easy to fix. See below for our top tips on DIY cleaning and prevention. If you have serious or recurring mould, or you have health or respiratory problems that might be aggravated by mould spores, then it might be time to call in an expert. 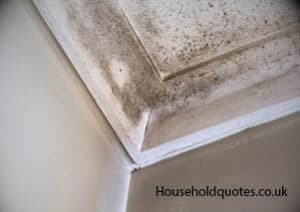 A good mould removal specialist should be able to remove the mould effectively and advise you on likely causes and how to prevent further problems. For this reason, you need to make sure that the company or contractor you choose is trustworthy and able to fix the problem for good. Repeat business might be great for them but it’s not so good for your wallet! Get recommendations from friends and neighbours and don’t be afraid to ask questions when you are choosing your contractor. Quotatis is a good resource for selecting trustworthy contractors for a range of jobs. The cost of clearing mould should fall in between £50-£400, depending on the severity of the problem. If you have a small area of mould and are ready to tackle it yourself, you need to start with some simple equipment. The good news is that you will probably have the basics in your cleaning cupboard. It is very important to protect yourself from the nasty spores you are about to shake loose. If you do not already have these items then you will be able to pick them all up for a few pounds at B&Q. Make sure that the area you are cleaning is well ventilated: open any windows and set up a fan if you have one. Once you are happy to begin, apply the cleaning solution and scrub the black mould well with the brush. You might want to test a small area first to make sure that the solution will not damage your paintwork. Unfortunately, removing mould from fabric is a little more difficult. If the mould is bad then you might be tempted to simply throw away the items and start again. But there are a few things you can try first. Dry the item thoroughly and brush off the mould with a clothes brush or old toothbrush. Do this outside, if possible, and make sure your mouth and nose are covered. A vacuum cleaner can also be used on furniture to remove as much mould as possible. A normal detergent or a light bleach solution can be used to gently clean fabrics. Always check the labels first and spot check on an inconspicuous area if needed, as non-colourfast items will be faded by the bleach. Some clothes can be washed in the machine with a little bleach added to the tub while others may need specialist dry cleaning to remove mould. What is Causing Mould in Your Home? The most common cause of mould in the home is damp from condensation, or from a combination of high humidity and poor ventilation. Black mould is often found in bathrooms, around windows and behind furniture. Bathrooms have high humidity and are often home to damp towels which hold moisture. Mould forms around windows because they are the coldest point in the room and condensation builds up around them. Mould on ceilings often appears near the edges, where insulation is lacking. Black mould on walls often develops behind large or fixed pieces of furniture, where airflow is limited. If you want a truly mould free home then cleaning off the mould is only the first step. Anti-mildew paint can be applied to a clean area to discourage future growth but it cannot prevent the build-up of condensation. There is really only one sure-fire way to stop mould from ever coming back: find the cause and fix it. Mould thrives in a humid environment so the simplest way to prevent regrowth is to ensure that there is no damp in your home. Use extractor fans in the kitchen and bathroom, avoid drying clothes indoors, and open the windows to air the house whenever you can. Adequate ventilation will prevent the build-up of damp. Check your insulation. Cold spots on the walls and ceilings encourage condensation so make sure that your insulation is doing its job! If you are still struggling to keep your home dry, a dehumidifier can be a great investment. You can pick up a small model for as little as £100, which is a lot cheaper than frequent redecorating. If you hire a specialist to deal with your mould problem then they should be able to give you specific advice about preventing the return of the problem. This is why it’s important to choose a reliable and knowledgeable contractor.